We're offering ideal tools for you to use on your PCs (or Macs with Windows installed): practical, powerful, and user-friendly applications which will allow you to view and print various types of charts, using various techniques employed by astrologers around the globe. Our programs are international in scope, available in English, French, Italian and Spanish, providing for historical as well as current techniques -- from Ancient Hindu to European Classical to the latest Midpoint Astrology techniques -- as well as astrological research functions. 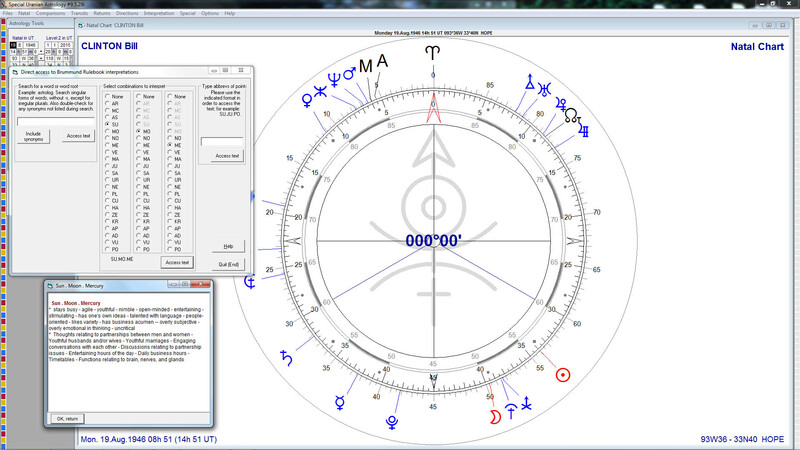 You can download a demonstration version of Astro-PC, Infociel, and Special Uranian Astrology in order to test them at home, using a chart of your choice, for which you enter the data. The price mentioned for each software is given in Euros. Other currencies are available by clicking on the menu “Select your currency” in the top right. You may also use the following website for exchange rates: Oanda. The Aureas programs are sold in a DVD box (19 x 13.5 cm) containing a CD and a user's guide in hard copy. They can also be downloaded from our website to avoid shipping charges. For more information, see the section “Shipping method”. Astro-PC (in English, French, Spanish, and Italian) is the most comprehensive and most popular of our programs. Its current state of development required many years of hard work, and it undergoes continual updates and improvements in response to the needs of the astrological community. Wherever important new astrological techniques of substance develop, we strive to integrated them into our program for your use. Astro-PC is powerful, accurate, and easy to use. Tutoring lessons and extensive on-screen help are available for learning and navigating through the program. Astro-PC is ergonomic, aesthetically designed, readily customized, and answers the needs of most all astrologers. Its technical design, scientific data input format, varied graphic and print options, and remarkable print quality make the program of noteworthy value. Astro-PC comes in two versions: a layman's version called BASIC, and a professional version, called PRO. You can update your program from Basic to Professional version at any time, for instance if you need more astrological functions. The listed price includes the program itself, handbook (on-screen or in hard copy, if your software was shipped by mail), and free assistance by email with qualified Customer Service. 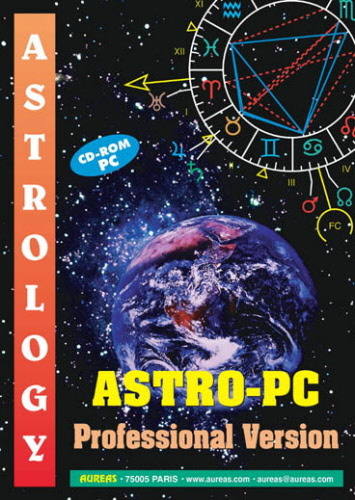 Astro-PC Basic version is precise, powerful, and easy to use, satisfying the needs of a majority of astrologers. Astro-PC Professional version is the most powerful and comprehensive of our software line, and is for professional use. In addition, various INFOCIEL special application modules have sprung out of the ASTRO-PC program and follow the same compatibility standards. Each INFOCIEL module contains selected functions from ASTRO-PC, plus extras in some cases, designed to meet the needs of specialist methods and techniques. Thus there is a module for those using Traditional astrology, another for Karmic astrology, another for Uranian astrology, and others for still other schools and techniques. Many, but not all, of these, are available in English. One key feature of the various specialized modules is that they automatically work together if you choose to add other modules together with them. You may start with one and add others according to your needs in order to build a combined set that suits specialist needs and work habits. 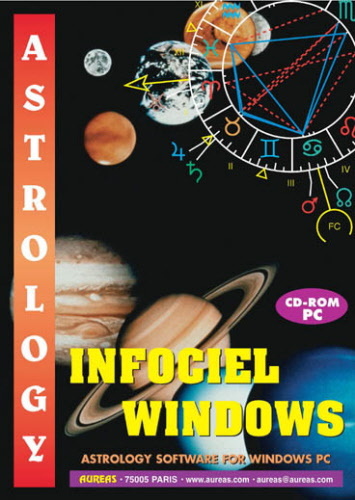 Infociel Windows: This program includes the functions most frequently used in astrology, as well as functions according to the humanistic school of astrology, including the mandala display. It also includes a Biorhythms function. Special Uranian Astrology: This is a program specifically designed to implement Uranian Astrology as taught by 50-year practitioner and specialist Ruth Brummund. It includes Aureas on-screen dials for precision midpoint analysis, authoritative Brummund midpoint interpretations with an on-screen searchable Lexicon of midpoints, Aureas Atlas, Time Change Files, Graphic Ephemeris, Basic Research Functions, and the Brummund Uranian Mandala psychological profiling tool, all built-in and included as a single, standard, comprehensive package. Other software: Programs for Numerology, Tarot, and other techniques are offered in addition to Astrology programs -- available only in French for the moment. For more information, see our French web site. Aureas programs are provided with security devices to avoid illegal copies and to afford continued after-sales service. Our programs are sold with a single user license, and are consequently intended for use on a single computer. If you want to use a program on various PCs, you can acquire a USB security key for an extra cost of 65 Euros if you order it at the same time as your program, or for 80 Euros + shipping charges if you do it later. See this page for more information. Warning: This product is currently out of stock and no longer available. If you want to use the program on two computers, see the next paragraph. INSTALLATION ON A SECOND COMPUTER: If you use two computers (but no more), an installation on a second PC is also possible for an additional cost of 50 €, so without having to use a USB key and taking the risk of losing it. Click here to purchase a second serial number at the same time than your software. Its calculation time frame covers over 12,000 years of ephemerides -- Gregorian or Julian calendar -- any chart from the year 4000 B.C. to the year 8000 A.D. with accuracy suitable for most any type of delineation. High accuracy of 1.5 seconds of an arc for the years 1900 to 2050. Astro-PC works in tropical zodiac or sidereal zodiac with a number of options you can program yourself. You can also define unequal constellations and include or exclude corrections for Nutation, display of fixed stars, etc. The parallax can be taken into account in certain astronomical computations. The data input format is scientific in format, originally designed for research, and practical. Two input modes are available: a full mode, for former users of our programs, and a simplified format, more intuitive for new customers. Help files are integrated to facilitate the input process. Preloaded Daylight Saving Time and Summer Time tables cover the entire world: more than 700 countries and states based on research data from Françoise Schneider-Gauquelin, Aureas, and Blake Finley. There are help files with comments for each country or state. Updates of the Daylight/Summer Time files can be done easily from the program or our website. Thousands of geographical locations for cities around the world are stored in memory, including all major cities. If needed, data for more remote locations can be entered manually and stored. You can save an unlimited number of charts and organize them in various files: clients, colleagues, family, friends, etc., and these can be accessed at any time. More than 25000 charts of celebrities, organized by category, including athletes, politicians, actors, scientists, and other professions, are included with Astro-PC. Birth information has been verified by specialists in birth records analysis. The database searches (countries, cities, saved charts) can be made quickly and easily with various methods. A management function for the natal charts files allows you to organize them as you wish. 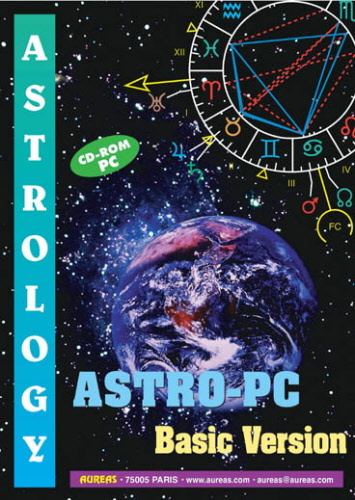 There are numerous programmable options -- Astro-PC can be tailored to most any astrological system and most any astrologer's specification: more than 300 choices and options are available. Options windows allow you to automatically set up the program to the standard options of about twenty different schools of Astrology -- Traditional, Uranian, Humanistic, Sidereal, Karmic, Indian/Vedic, for example. Of course, you can also make your personal settings. 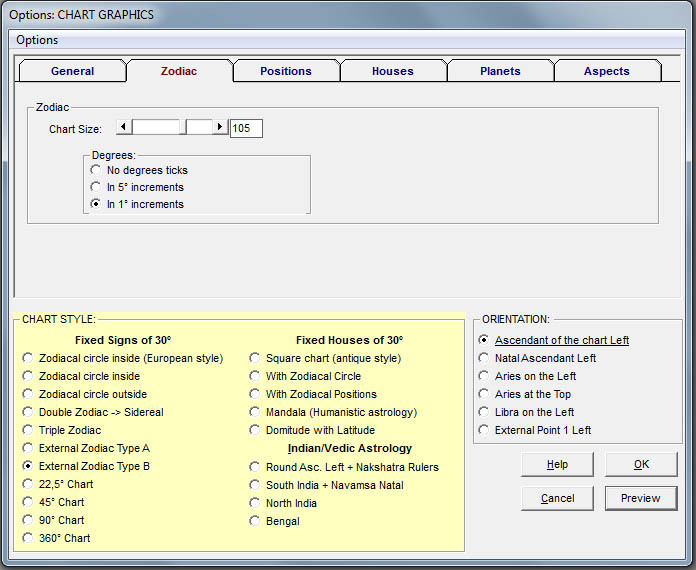 More than 20 chart format types can be displayed on the screen: Ascendant or Aries on the left, Indian/Vedic charts, traditional square charts, double zodiac, fixed houses, mandala charts, external zodiac, uranian midpoint charts, and others. Thirteen computation methods for measuring planetary strength/weight -- You can modify the rulerships of the planets in the signs. 32 aspects can be displayed -- 5 major aspects, 14 minor aspects, and 13 programmable aspects -- with information in the data tables specifying if the aspect is applying or separating, dexter or sinister. Special options are available for “false aspects” or dissociated aspects. Adjustable orbs, by aspect in the simplified method, or by aspect and planet in the advanced method. An expert setting window allows also to configure the orbs by planetary pairs and by aspects. Choice of 23 asteroids (see below); True, Mean, or Corrected Lunar Apogee (Black Moon); Solar Apogee (Black Sun); True or Mean Lunar Nodes; and you tell the program what you want to see displayed on the chart, with or without aspects. You can display many optional factors on charts: East Point, Vertex, Point at 90° from Asc, Sunrise point, Sunset point, Ura/Sat midpoint, Sat/Ura midpoint (according to C.Castanier), New Moon position, Full Moon position, two manually-specified External points, and the Transneptunian factors from the Hamburg school: Cupido, Hades, Zeus, Kronos, Apollon, Admetos, Poseidon, Vulkanus. Version 10 also offers: Anti-Vertex, Hermes Pole, Galactic Center, Galactic Plane, Gamma Point Maxwell, Sensorium Point (as per Catherine Castanier), Logos or PointK (according to P.B. Decroze). Many Arabic parts are included, and this feature can be customized. Eighteen house systems: Placidus, Regiomontanus, Campanus, Koch, and others. Twenty three asteroids are available: Chiron, Ceres, Pallas, Juno, Vesta, Sedna, Varuna, Quaoar, Ixion, Orcus (2004DW), 2002AW197, 1992 QB1, Astraea, Amor, Psyche, Eros, Pholus, Nessus, Haumea (2003 EL61), Eris/Xena (2003 UB313), Makemake (2005 FY9), Sappho and Hygiea. Computation frame: from 1600 to 2200. Heliocentric astrology: various functions are available, such as natal chart, transits, comparisons and solar returns. Keyboard shortcuts allow you to quickly activate the different groups of the astrological toolbox, perform the main functions of the program, and so on. 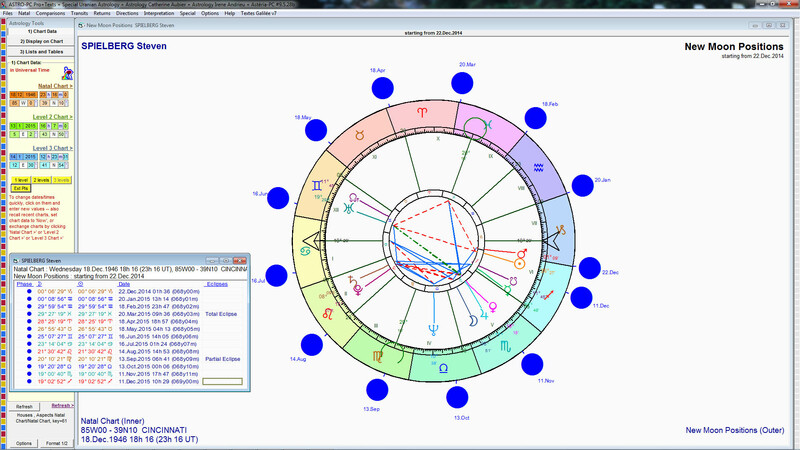 For example, just press “n” to display directly the Natal chart, without using the menus. Charts can be displayed to cover the full screen, or placed side by side (on two neighboring windows), superimposed in dual wheels, or superimposed in triple wheels. Astro-PC can display multiple windows, i.e. you can see different charts in several windows, and the windows can be click-and-dragged around the screen to suit your needs. Many charts can be resized by clicking the borders and resizing to your needs. 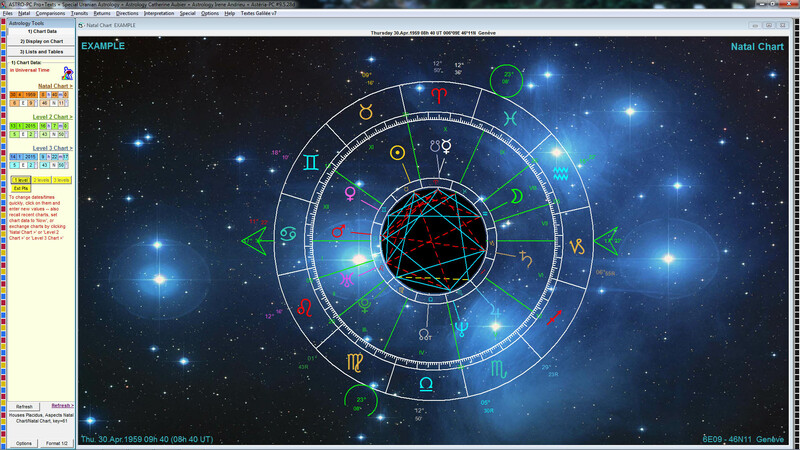 The colors of signs, planets, aspects, and other chart elements can be easily modified. Intercepted signs can be displayed with a different color than the other signs. 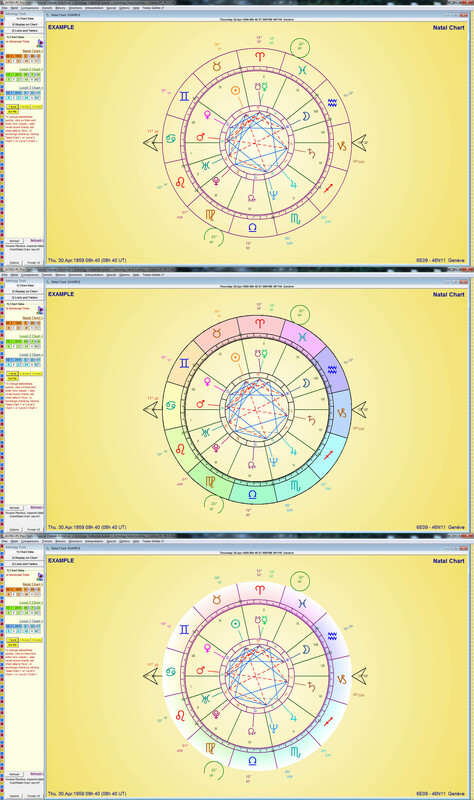 For the background of the astrological charts, many options are possible: astronomical image (example), scroll style image (example), single color (example) or color gradient (example). Similarly, the background of the signs may be displayed without color (transparent), with a solid color or with a color gradient (example). The size of planets, signs, characters, and aspect lines in the chart can be adjusted. 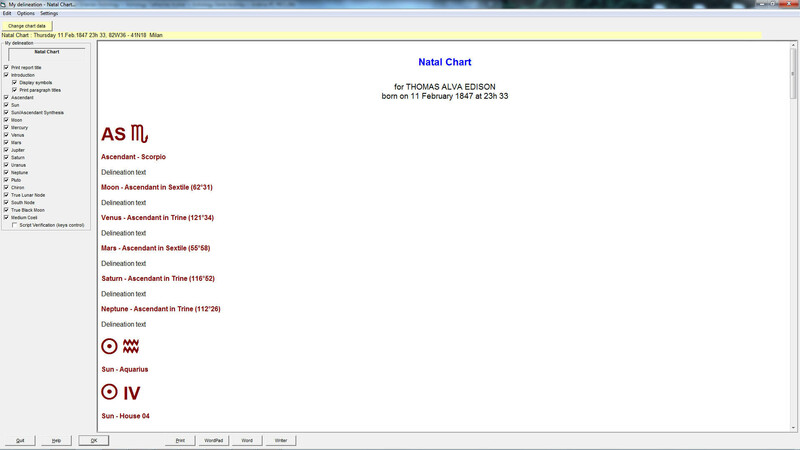 The display of tables, and alterations of some chart elements can be quickly changed using the tools window buttons. You can display midpoints, transneptunian factors, arabic parts, asteroids, and other factors around the periphery of standard charts. If you work with different types of charts (classical / uranian / sidereal / tropical etc. ), you can pre-configure up to 11 different options files, and change from one set to the other, according to your needs at the given moment. 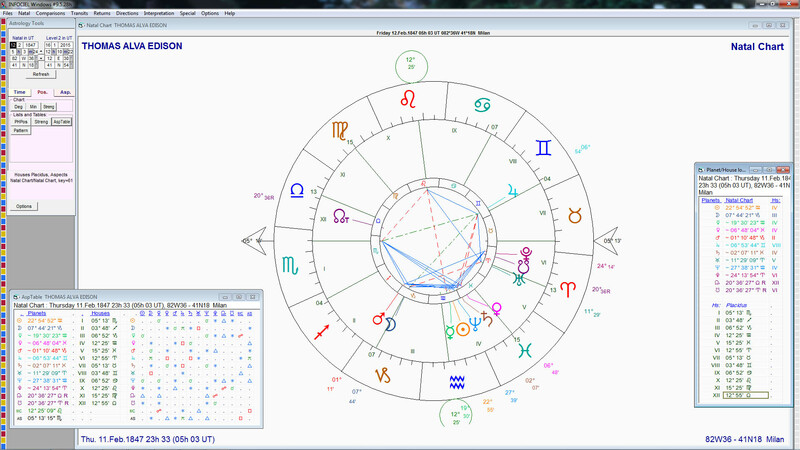 Astro-PC computes all types of usual charts: natal charts, solar and lunar returns, transits, secondary progressions, converse and symbolic directions. It can also display a number of specialized charts on-screen: angular charts (Gauquelin sectors), geocentric charts, heliocentric charts, local space charts, uranian charts, harmonic charts, horary charts (with ruler and dates), monthly solar return charts, solar and lunar ingress charts, progressed new moon charts, solar arc chart, and more. 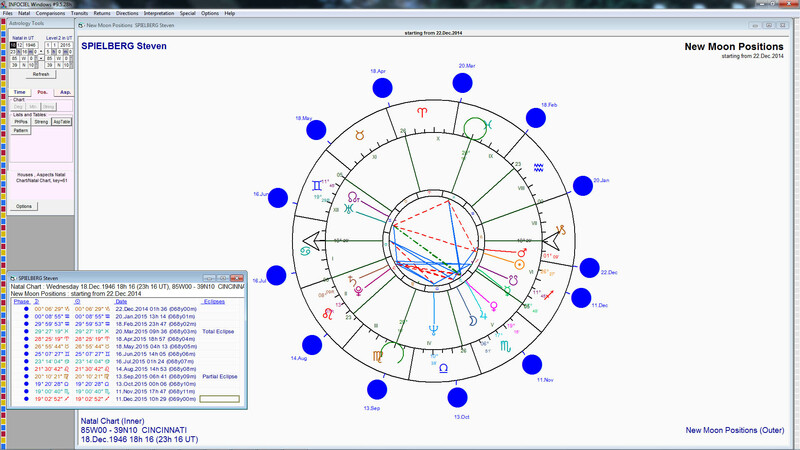 Astro-PC displays compared charts for synastry, the composite midpoint charts (relationship charts), and the midspace/midtime chart. The real time clock chart allows you to visualize on the screen the motion of the transits with an adjustable time increment of your choice. A complete tools palette allows you to perform many functions quickly and easily: with a simple click of the mouse, your screen will show the previous or following solar return -- or any other return or direction -- immediately changing the parameters of the chart displayed on the screen. With Astro-PC, two skins are available for the display of the tools palette: a classic skin or another more intuitive and colorful. Contextual menu: when a chart is displayed on the screen, you can get many complementary information about it using the right button of the mouse. This will show an extra menu with several choices, depending on the software you are using. The contextual menu is for example available by clicking on a Planet, a House cusp, an Aspect, a Sign. If you click at the bottom of the chart or at another point, the contextual menu that appears allows you to get various information about the chart (midpoints, transneptunian planets, etc.). Map of the Azimuth coordinates (with or without fixed stars), Astro-geographical map with zoom function, Celestial map (spherical or flat), Graphic ephemerides, Septenary diagram, Graphic charts of planetary chains and planetary strength/weight, Astrological tree of life, etc. Accurate positions of planets in signs and houses -- solar houses, lunar houses, Nakshatras, or Ptolemy's terms. Aspects: sorted or unsorted; parallels and declinations; harmonic aspects; midpoint trees. Astronomical data, karmic data, midpoints, eclipses, Arabic parts, harmonics, planetary strength/weight, domitudes, distances in longitude and more. Family resemblances: you can do certain types of genealogical/astrological searches with chart files of families or groups. You can print out pages of ephemerides as in our “New International Ephemerides 1900-2050” and also get pages of tables of houses as in our book “Tables of Houses”. With Astro-PC, you have even more possibilities: You can get the ephemerides with the tropical or the sidereal zodiac, and that for the years 3000 BC to 3000 AD. Statistics functions allow you to do research in the charts of celebrities and others: you can for example get the distribution of the Sun in the 10th house among politicians, see all natal charts having a Sun-Pluto square or the Moon in Libra, and more. The results are displayed in the form of tables or graphs. With this function you can get the graphics of your Physical, Emotional and Intellectual cycles for any day. Natal Chart, with several choices of emphasis: Planets+Ascendant+MC in signs; planets in houses; aspects (major and minor). 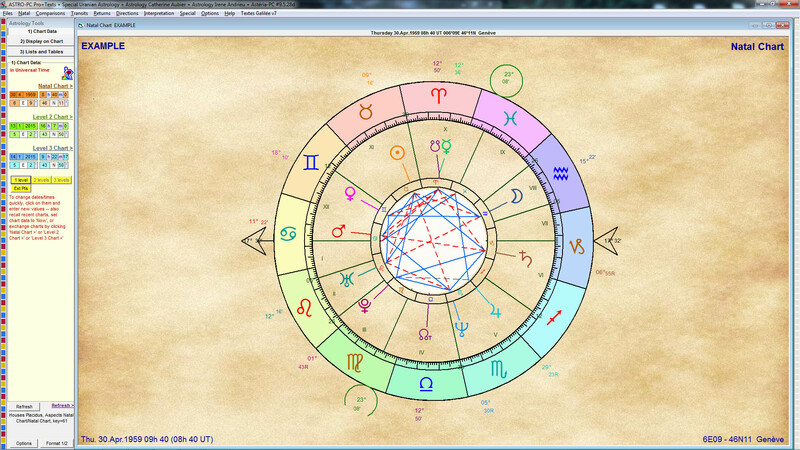 Chart comparison (synastry): Delineation of aspects made between the planets+Asc+MC of two different charts. Solar Returns: SR houses in natal houses; SR houses in signs; SR planets in SR houses; SR planets in natal houses; SR planets in signs; Aspects between SR planets; Aspects between SR Planets and natal planets. Important note: The delineation files are sold blank. You may either fill them with your own astrological delineations, or purchase those compiled by Aureas (primarily in French, but also in other languages in the future). Texts can be edited at your discretion and are sold separately. Installation and configuration of the application are quite easy due to installation help screens. Complete on-screen help and printable user's guide available at any time. There are many other helps to become familiar with the use of the program: Tips of the day when you start the software, automatic display of information when the mouse is on a function, contextual menus, and more. Chart and Table graphics/data can be pasted into word processing and graphics programs. Chart export in BMP or JPG format. Data export in Text, RTF or Excel format. High quality printing on most all printers. The program is supplied on a CD-Rom or can be downloaded from our website. Minimum configuration required: hard disk with 160 Mb of free space, CD-Rom drive, USB drive, Windows 10, 8, 7, Vista or XP-sp3 (not compatible with Windows 10 "S mode", Windows Phone or Windows 8 RT). This program is protected against illegal copying (see the Software security page for more information), and is supplied as a single-user version. If you want to use it on two computers, see here. To download a Demo version, click here. 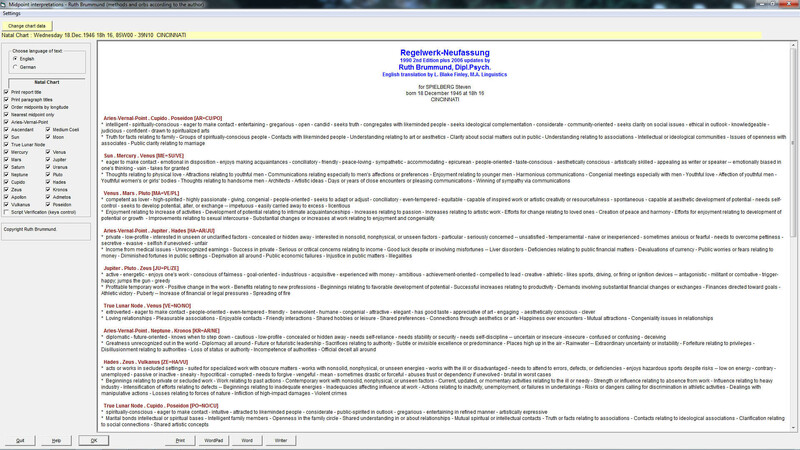 The professional version offers all the features of the basic version (see above), plus numerous others. Therefore, you should first see the description of Astro-PC Basic. The Pro version provides many additional functions and options, which are summarized below. By default, the Pro version offers hundreds of thousands of coordinates for cities around the world. If needed, you can install an additional and expanded database that includes more than three million geographic coordinates, including the smallest village. - Solar returns (one year of SR dates). Data can be displayed in columns or in lists, chronological or not, or in calendar format. The date search functions allow you to choose the planets you want to include, time frame for searches, starting dates, aspects to include, and other options. You can also do reverse searches in time (“converse” feature). Multiple search function entirely programmable (time frame, aspects...): this function will display a sorted table including the aspects of all the available forecasting methods you have selected (Transits, Directions, etc.) -- It will also specify if the aspect listed is already present in the Natal chart or not. For example, if you have experienced a particular event on a certain day and you don't find (with the prognosis methods you usually use) what is the aspect or configuration that can explain this event, you can use this function to search, for that day, what are all the aspects that were formed with all the forecasting methods offered in the program. This will help you find more easily what is the aspect and forecasting method which can be the origin of the event. Date search for a file: this function allows you to perform a date search for a planet in the various charts in a chart file. For example, if you select the chart file of a family, you will be able to see all the aspects formed by Jupiter in transit for each chart, in chronological order. Several methods of Ascendant rectification are available, based on the dates of the major life events (marriage, birth of children, career development, etc.). 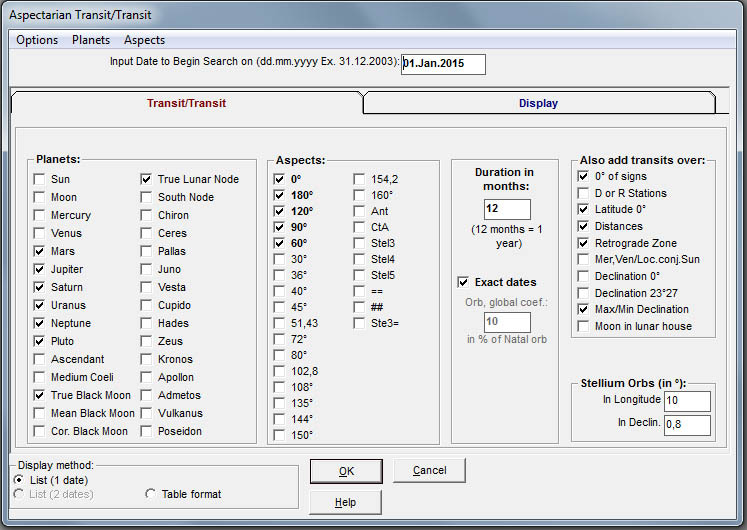 The Aspectarian functions allow you to list the aspects like an ephemeris. Entirely programmable, they are available for Real Time cycles, daily transits, transits compared to the natal chart, progressed cycles, profections, converse directions, and tertiary directions. With several aspectarian functions, you can also search in time for stelliums composed of 3, 4 or 5 planets. This is useful in mundane and forecasting astrology. For the declination aspects, you can also research configurations of 3 planets. Aspectarian Transits/Progressions: This feature lets you know when the transiting planets are doing aspects with the progressed planets. Transit dates (completely configurable): delineation of transit with estimated dates of their effects. Accuracy to 01” from the year 3000 B.C. to the year 3000 A.D.
More than 200,000 geographical locations available, or three million if you install the expanded atlas of world cities. Multi-windows display -- you can view several charts at once on the screen. Indian/Vedic Astrology: friends/enemies, ashtakavargas, shodashvargas, significators, periods or dasas. The charts can be displayed in the traditional square format (South India, North India or Bengal), or in round format with nakshatras. Planetary strengths according to D. Labouré, or Gillet. Positions of hypothetical planets : Vulcan, Proserpine, Transpluto, Nemesis, Kore, etc., special astronomical points, and planetary nodes. Positions of 1500 fixed stars, with aspects in the natal chart. True distances between planets. Function “click and drag”: When you click on the symbol of a planet and move it on another planet, a window will indicate when the first planet forms transiting aspects with the second planet. You can do the same with a sign or a house to get the ingress in the sign or house. Advanced functions including Primary (Campanus, Regiomontanus, Placidus), Tertiary and Evolutionary directions; Luni-solar returns; Lunar phase returns; Local Space Charts; adjustable real-time clock chart for current transiting positions. Horary Astrology: Horary charts with 30° scales, Dynamic Clock Charts. New and Full Moon charts; Lunations for the full year; Chart of the New Moon before birth. 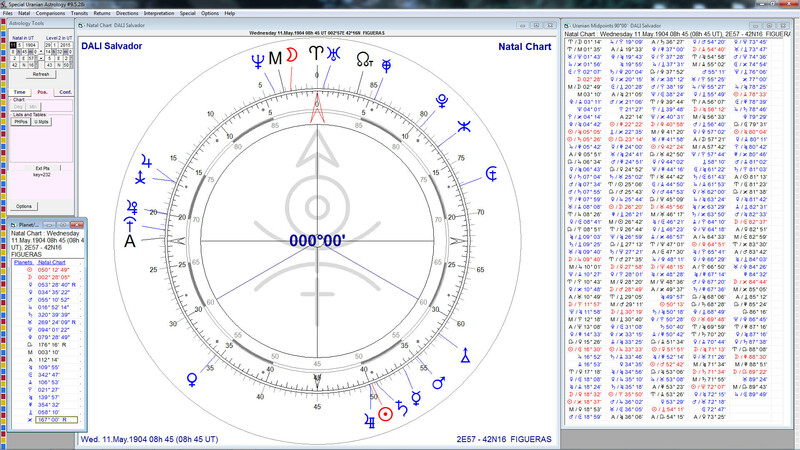 Solar charts; Nodal charts; Profections. Map of the stars and constellations with location of the ecliptic and planets. Rising and setting of the planets; Domitudes; Positions and aspects; Sensitive points; Echo Points according to Danièle Jay. Temporal Cylinder (according to Pierre Etevenon). Converse functions. Option to personalize printed pages. Optional display of various data outside the chart: midpoints, Uranian Transneptunian factors, various hypothetical points, fixed stars, arabic parts, and others. As for the Basic version, you can print out pages of ephemerides as in our “New International Ephemerides 1900-2050” and also get pages of tables of houses as in our book “Tables of Houses”. Ephemerides: With the Professional version, you can not only get conventional ephemerides with the planetary positions in longitude, but also obtain the positions in declination or in latitude. This is one of the more interesting improvements of the latest versions. They are also available in the basic version of Astro-PC but with less choices. With this feature, you can display on a chart up to 45 individual points: 22 points are used by the program to show the main elements (planets, etc. ), and 23 others are programmable. These points are predefined to display a specific astronomical or astrological element, but you can modify it and select any other available point. Thus you can display on a chart any element between those listed below (for example, all the asteroids, a selection of mid-points, etc.). Traditional planets: from the Sun to Pluto. Transneptunian planets of the Hamburg School: Cupido, Hades, Zeus, Kronos, Apollon, Admetos, Vulkanus. Asteroids: Chiron, Ceres, Pallas, Vesta, Juno, Sedna, Varuna, Quaoar, Ixion, Orcus (2004DW), 2002AW197, 1992 QB1, Astraea, Amor, Psyche, Eros, Pholus, Nessus, Haumea (2003 EL61), Eris/Xena (2003 UB313), Makemake (2005 FY9), Sappho and Hygiea. Lunar Nodes: North and South, mean and/or true. Black Moon/Lunar apogee: True, mean, corrected or according to Beriault. And the same for Priape (the point opposite to the Black Moon). Special points: Black Sun, East Point, Vertex Point, Vernal Point, Point 90° from the Ascendant, Sunrise point, Sunset point, Ura/Sat and Sat/Ura midpoints (according to Catherine Castanier), New Moon and Full Moon positions. Arabic parts: Part of Fortune and any Arabic part programmed in the software (about thirty) or simply configurable. New special points: Local Ascendant and MC, West Point, Lilith Sepharial, Point of transformation, Lunar Parallax, Ecliptic Middle and Nadir, Vertex, Proserpine, Transpluto, Kore, Vulcan, Hermes pole, Daimon, Tyche, and more. Midpoints: You can display any midpoint. Fixed Stars: Choice of many stars. Echo points (according to D.Jay): Display of the Echo for the planets or the main points. External points: Ten programmable points allow you to show points not calculated by the program. Determination of the temperament by tabulation of hot/cold/humid/dry qualities. Determination of the Almuten (with calculation details), of the Hyleg planet (or Aphet), of the Anaretic planet, of the Alcochoden. 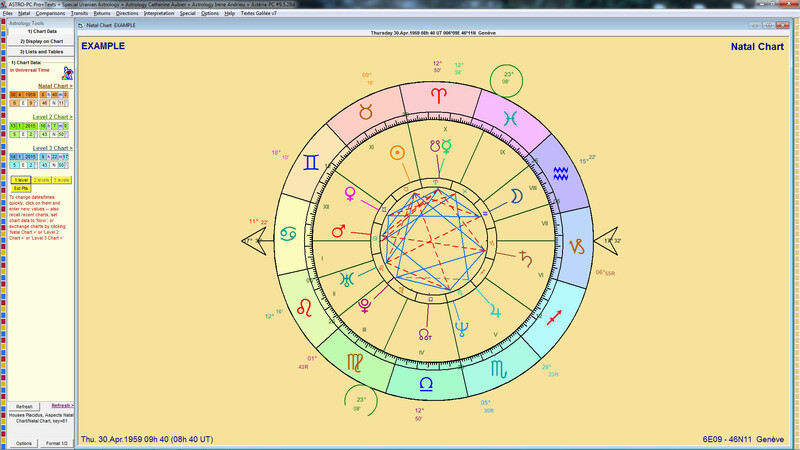 Hermes Trutina (Prenatal Epoch) charts with the Natal Moon on the conception Ascendant or Descendant. Display of the adjusted birth date according to the choice made. Solar Return, providing the “Annual Ruler”. Hieroz-Bonatti Directions : usual aspects according to Bonatti. Fridaries (alfridaries): planets which have dominant influence during the different periods of life. Systems of domitude including the Porphyry system. House systems including Alcabitius and Sign-house (each house 30° and starting at the beginning of each sign). Planetary strength/weight, including Almuten (per Ibn Ezra). The calculation of planetary strength/weight allows one to define dignities and exaltations of planets : 1) the planetary rulers of triplicities, 2) decan rulers, 3) planetary terms. New “hour” function giving the planetary hours for the complete day (for horary astrology). The program is supplied on a CD-Rom or can be downloaded from our website. Minimum configuration required: hard disk with 160 Mb of free space (430 Mb if you install the expanded atlas), CD-Rom drive, USB drive, Windows 10, 8, 7, Vista or XP-sp3 (not compatible with Windows 10 "S mode", Windows Phone or Windows 8 RT). This program is protected against illegal copying (see the Software security page for more information), and is supplied as a single-user version. If you want to use it on two computers, see here. 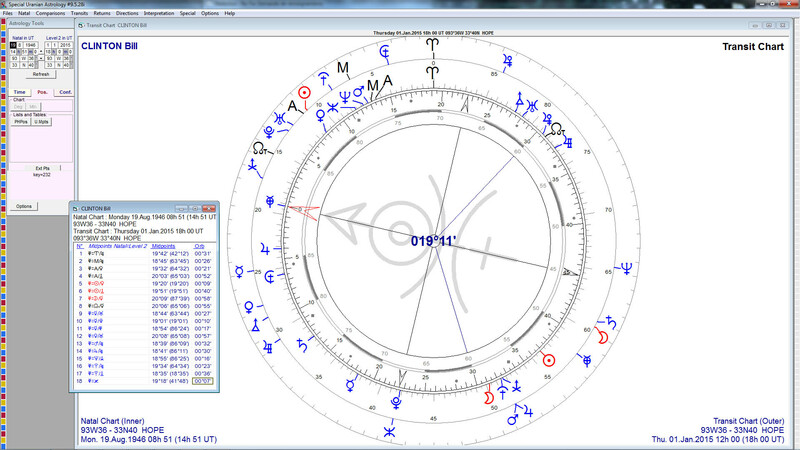 Practical, efficient, and easy to use, Infociel Windows is a graphic astrology application for personal computers with Windows. It includes the functions most frequently used by most astrologers --Traditional astrology, as well as Humanistic astrology-- at a very reasonable price. Large time frame for computations: up to 12,000 years of ephemerides -- from the year 4000 B.C. to the year 8000 A.D. High accuracy of 1.5 seconds of an arc for the years 1900 to 2050. Complete and scientifically-formatted data input. Save and recall functions for an unlimited number of charts. More than 3000 charts of celebrities are stored in memory, with birth data verified by P. Petitallot, birth records analyst. Daylight Saving Time and geographical locations of cities around the world are built in: more than 550 countries and states, with notes and references, data from Françoise Schneider-Gauquelin, Aureas, and Blake Finley. Thousands of geographic locations for cities are pre-loaded -- others can be entered manually. 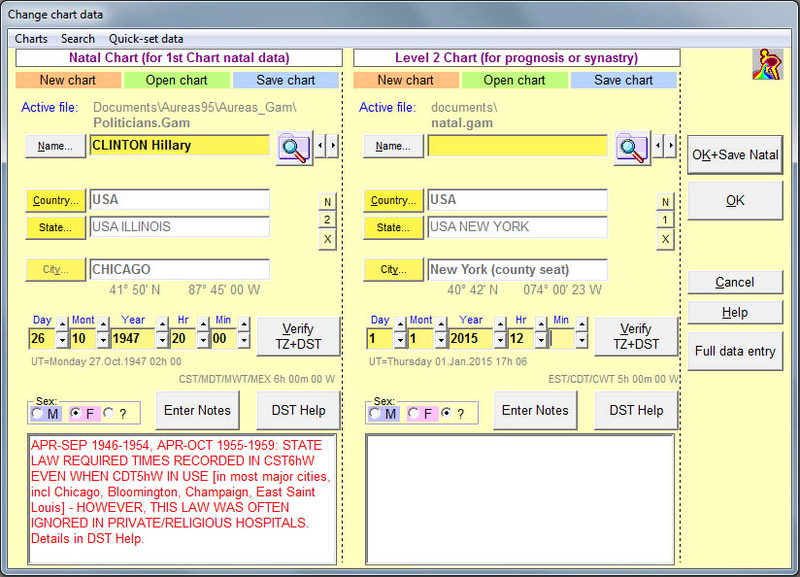 Copy charts and tables to other applications such as your word processor with a single cut and paste command. A user-friendly toolbox provides shortcuts to access various functions with a click of the mouse. Returns, directions, and other functions for the previous/next year can be obtained with a single click of the mouse. Installation and configuration of the application are quite easy due to installation help screens. A user's guide with tutorial and extensive screen help are available upon request. Quality printing on most all printers. Presentation of charts: Full page/full screen, side by side, or superimposed in a single chart. Zoom function to enlarge or reduce viewing size of charts. 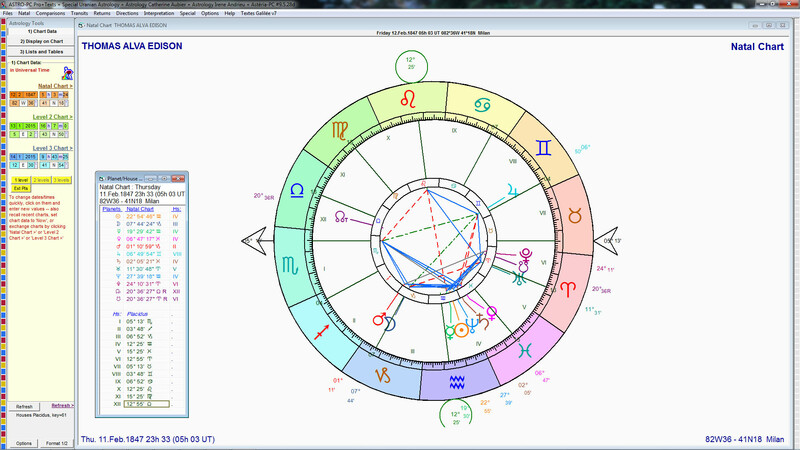 Chart displays can be altered to: Ascendant on the left, Aries on the left, External Zodiac, Humanistic mandala, or two methods of Fixed houses. Adjustable size of many elements in the chart. Choice of the symbols for houses, planets, signs, etc. The color of each element --sign, planet, aspect-- can be changed individually to suit your preferences. 19 aspects available, 5 major aspects and 14 minor aspects, with programmable orbs. New Moon cycles -- charts and dates. Full Moon cycles -- charts and dates. Progressed New Moon chart with dates. Dates of the progressed New Moon. Static, dynamic, or step-by-step Transits -- the amount of motion through time can be programmed. House systems: Placidus, Regiomontanus, Campanus or Equal houses. Planetary strength/weight -- several methods -- with graphics you can adjust directly on the screen. Various data tables: planetary positions, aspects, and others. Dynamic screen display on the chart: aspects planet by planet, degrees and minutes, planetary strengths/weights. This program is sold directly by Blake Finley, American specialist in Uranian Astrology. To order this software, click here. Practical and efficient, Special Uranian Astrology is an astrological software developed in collaboration with Ruth Brummund of the Hamburg School. This is a program specifically designed to implement Uranian Astrology as taught by 50-year practitioner and specialist Ruth Brummund. It includes Aureas on-screen dials for precision midpoint analysis, authoritative Brummund midpoint interpretations with an on-screen searchable Lexicon of midpoints, Aureas Atlas, Time Change Files, Graphic Ephemeris, Basic Research Functions, and the Brummund Uranian Mandala psychological profiling tool, all built-in and included as a single, standard, comprehensive package. The californian astrologer Blake Finley also helped in the development of the technical functions of the program (www.uranian-institute.org). Large time frame for computations: up to 12,000 years of ephemerides -- from the year 4000 B.C. to the year 8000 A.D. Copy charts and tables to other applications such as your word processor with a single copy and paste command. A user-friendly toolbox provides shortcuts to access various functions with a click of the mouse. Solar ingress for the previous/next year can be obtained with a single click of the mouse. Chart displays can be altered to: 90° Chart, 360° Chart, Libra on the left. The color of each element can be changed individually to suit your preferences. Two choices for the dial type. Traditional and transneptunian planets: Cupido, Hades, Zeus, Kronos, Apollon, Admetos, Vulkanus, Poseidon. Two programmable external points, Lunar nodes (true or mean). Uranian Mandala according to Ruth Brummund (with choice of axes). Graphic ephemerides (for planets or midpoints). Triple wheel Natal/Transits/Directions with dial. Positions of the Sun for a file (analysis of the compatibility of a group). Uranian data and midpoints, distances and half-distances (Natal or Directions). Uranian cluster synastry (chart comparison). Multi-axial analysis for any point. Statistics: search of midpoints on any given point, distribution on the zodiac or sectors, etc. You can add two external points. 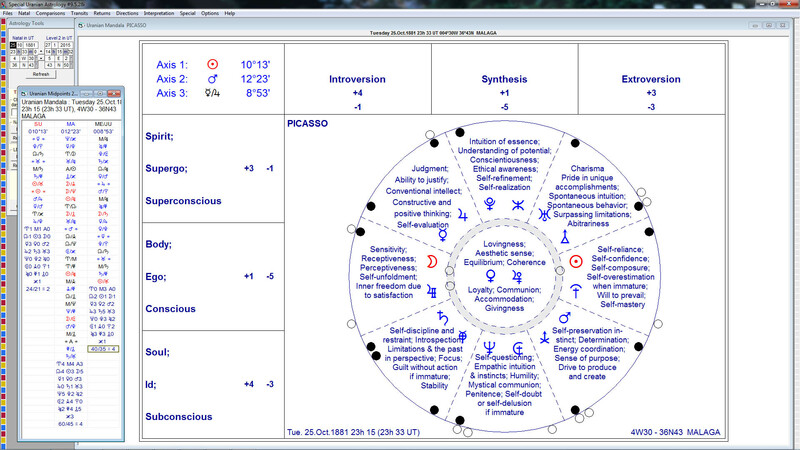 - Interpretation of the midpoints in conjunction with planets. Amount of text: from a few pages to several dozen, depending on the number of midpoints interpreted. - Analysis of a midpoint or a planetary picture (using a search function). - The source texts are not editable (you can change promptly the interpretation obtained for an individual chart, but not once and for all by changing the original texts). - The interpretive texts are intended for private use. You can give them to your customers or friends, but any large-scale distribution, paid or free, in any form whatsoever (internet, etc. ), is not permitted. - An additional function allows to enter your own texts in a separate file and use them in place of those of Ruth Brummund. If you use two computers (but no more), an installation on a second PC is also possible for an additional cost of 50 €, so without having to use a USB key and taking the risk of losing it. If you select this option, you will receive two serial numbers, one number for each computer. Our programs are sold with a single user license, and are consequently intended for use on a single computer. If you want a multi-license version, you can acquire this USB security key. This key allows you to install and use your program on multiple computers. Simply plug it into a USB port on the PC where you want to work with the software. Its price is 65 Euros if you order it at the same time as your program, or 80 Euros + shipping charges if you do it later. In the latter case, you must contact us via e-mail and not use this order page. Warning: Note that this USB key contains the protection of your program (or programs, if you bought more than one). It is thus the most important element of your purchase and you have to be very careful not to lose it.